The fennel bulbs I buy from Stefano on Via Garibaldi are about the size of a small fist, but have fronds that extend upwards so that they sometimes protrude from the top of my shopping basket. This is in contrast to the fennel found on supermarket shelves, which tend to be neatly trimmed and polite. I prefer the unruly version because the herby extensions come in very handy for recipes like this one. Raw fennel is such a great ingredient, particularly when sliced very thinly; the intense liquorice flavour can sometimes take you by surprise. 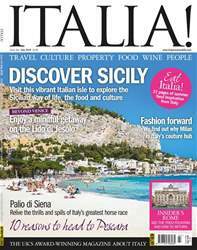 Making the most of the Italian summer is what the magazine is all about this month, with a zesty mix of inspiring features and beautiful photography to transport you to your favourite destinations.